May 14, 2010 - British Airways reports contingency plans for its cabin crew strike period of May 18, 19, 20, 21 and 22 and will fly more than 60,000 customers each day. All flights at Gatwick will operate as normal as will flights to and from London City airport during the entire strike period. At Heathrow, British Airways intends to operate more than 60 per cent of longhaul flights and more than 50 per cent of shorthaul flights in the first strike period and it will add to this schedule where possible. The airline will continue to fly to every shorthaul destination on its network. The airline will operate most of its revised shorthaul schedule at Heathrow using its own aircraft and cabin crew, but will supplement its schedule by leasing up to eight aircraft with pilots and cabin crews from five different airlines based in the UK and Europe. British Airways has also made arrangements with more than 50 other carriers so that it can rebook customers during the actual strike period onto their flights, if they had been due to travel on a BA service which has been cancelled. The airline is still available to hold further talks with Unite, the cabin crew union but wants customers to have early warning of its flying schedule to allow sufficient time for alternative travel arrangements to be made. Customers flying to/from Heathrow on a longhaul flight between May 18 and May 23 can now check their bookings on www.ba.com to see if their flight is still operating. The revised shorthaul Heathrow schedule between May 18 and May 23 will be available for customers on our website at 10am on Friday May 14. 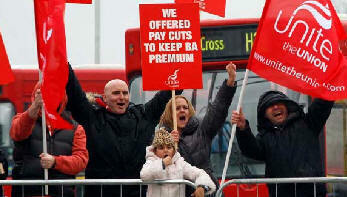 Willie Walsh, British Airways’ chief executive, said: “Unite’s leaders have deliberately targeted the busy half term holidays to cause as much disruption as possible for hard working families looking to spend some well earned time away. “We are confident that many crew will ignore Unite’s pointless strike call and support the efforts of the airline to keep our customers flying. “As the new government starts addressing the enormous economic challenges facing the country, it is sad that Unite’s priority is to seek to damage Britain’s links with the world. “Our offer is very fair. It addresses all the concerns Unite has raised during 15 months of negotiations and Unite knows we have compromised many times in an effort to get a resolution. This strike action is entirely disproportionate. “Our cabin crews are voting with their feet. Due to the numbers of cabin crew who are telling us they want to work normally since Unite’s latest strike call, the schedule will be slightly larger than we had originally anticipated. “We will fly tens of thousands of customers around the world on business trips and family holidays every day that a strike takes place. Many thousands more can be rebooked onto alternative BA flights or onto rival airlines. “I understand the deep frustration that customers who are booked from May 24 onwards must feel towards Unite. The union knew full well we could not publish a revised flying program at Heathrow across a 23 day period in one go. We will do all we can to give customers more clarity about their specific flight once we start to understand how many cabin crew are willing to work as normal. Customers in the UK wishing to rebook their flights can contact the airline on 0800 727 800 which is a free telephone line. British Airways has opened up an extra call centre manned by staff volunteers to help customers with rebooking and refunding queries. British Airways’ flight program is complex, involving the combination of rosters for 13,000 cabin crew, more than 3,000 pilots and 230 aircraft operating schedules. More than 8,000 flight and cabin crew have to be in the right place at the right time, either on aircraft, at airports or in crew hotels in more than 140 cities in more than 70 countries, every day. Customers are advised to check ba.com on a regular basis to see if their flight is still operating before departing for the airport. If their flight has been cancelled they should not come to the airport but contact British Airways or their travel agent. • Flights to and from London Gatwick will operate as normal. • Flights operated to and from London City will operate as normal, including services to and from New York. • More than 60 per cent of longhaul services into and out of London Heathrow will operate as planned between May 18 and May 23. The airline may be able to add to this schedule in the days ahead. • The airline will be able to operate more than half of its shorthaul flights into and out of London Heathrow between May 18 and May 23. The airline may be able to add to this schedule in the days ahead. • Flights operated by subsidiary OpenSkies between Paris and New York and Paris and Washington will operate as normal. Flights operated by British Airways franchise partners (Comair in South Africa and Sun Air in Scandinavia) will operate as normal. Flights operated by other carriers (including oneworld Alliance partners) which have a BA codeshare flight number will operate as normal. • All dedicated cargo freighter services continue to operate as normal.